Jian Jin, an assistant professor in Purdue's Department of Agricultural and Biological Engineering, hopes his hyperspectral-imaging device will be used widely by plant scientists and farmers nationally and internationally. The device scans a plant for physiological features, such as moisture, nutrient and chlorophyll levels, as well as different chemical spraying effects and disease symptoms to determine whether it is healthy or under stress. 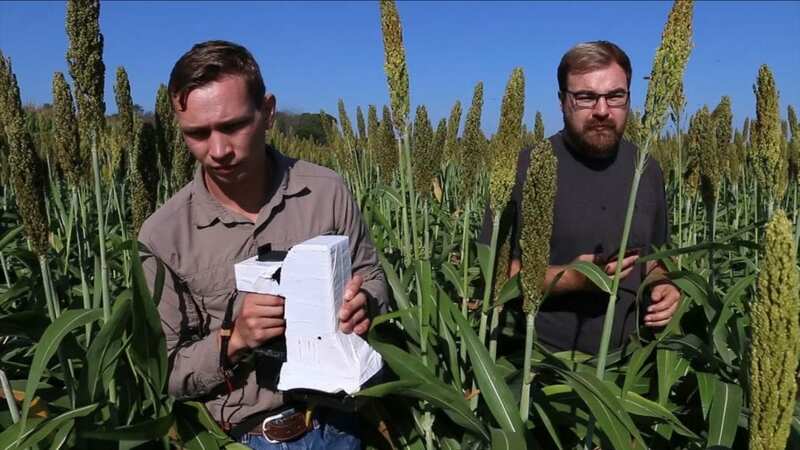 "My vision is this sensor will allow household farmers walking through a field to use a handheld device and a smartphone to get the same information available from very expensive phenotyping systems constructed by big companies and big universities in recent years," Jin said. "We have 600 million farmers worldwide, and very few of them are benefiting from high-end plant sensor technologies. Now, with this handheld device, most farmers can benefit." "We implemented both the hardware and software technologies into a handheld device that is light and easy to carry," Jin said. The sensor integrated the advanced image processing algorithm and plant features prediction models developed by Purdue scientists. These models were developed with Purdue's database containing years of plant research assays in both greenhouse and field. The models are also constantly improved and updated. "So we always have the most accurate predictions for the farmer," Jin said. "Due to multiple technical reasons, the sensor's prediction quality is much more accurate than any other types of crop imaging sensors that people have in the existing market," Jin said. "It's also constantly getting better because we scan plants every day and are upgrading both hardware and software technologies." Although the sensor is self-contained, the users also have the option to upload the measurements with geo-locations to a web-based cloud map service developed by Carol Song and her team at Purdue's Advanced Computing Group. The system generates plant stress and nutrition heat maps based on the sensor measurements, and provides interactive ag data querying functions at both farm and regional levels. This digital ag map system with sensor data can support many potential applications. For example the data collected will provide valuable information to state and federal officials about steps they can take to help farmers during severe crop stress periods as well as information about what types of crop yields can be expected. "If we can successfully distribute the sensors around the region, we can generate this digital ag map service to monitor the plant growth all over the region — which areas are under stress and which areas are having a good performance," he said. Jin's group at ABE is working on automation of this device. He and his graduate students worked last winter with a senior design group from Purdue's School of Mechanical Engineering and successfully implemented a robot to scan the leaves with the sensor automatically in the greenhouse. The robot utilized machine vision to recognize the target leaves and carry the sensor over there for a quick scan operation along the leaf's natural slope. Encouraged by the success in the greenhouse, Jin and his team is moving on for the design of the next robot in the farm field environment. "We hope to get a lot more data so we can have more valuable data services," he said. "We have great team work at Purdue to make it happen. Besides the engineers from ABE, the sensor's development has been greatly supported by breeders and biologists at Purdue, including professors Mitch Tuinstra, scientific director of the Purdue's Institute for Plant Sciences, and Tony Vyn, the Henry A. Wallace Chair in Crop Sciences. Carol Song and her team of data scientists from Advanced Computing Group provided the GIS map functions. Gerald Shively from Agricultural Economics has been promoting the application of the device as a social scientist."